On the 21st of October 1966, the village of Aberfan in south Wales was shattered by one of the worst disasters in Welsh and British history. Following days of bad weather, water from a spring had destabilized a huge coal slag tip – one of the black man-made mountains which surrounded the village. Thousands of tonnes of coal tip waste slid down a mountainside and devastated the mining village of Aberfan. The black mass crashed through the local school, where pupils were celebrating the last day of term. One hundred and forty-four people were killed. One hundred and sixteen were schoolchildren. Gaynor Madgwick was there. She was eight years old and severely injured. Her brother and sister were in classrooms either side of her. Both died. In Aberfan – A Story of Survival, Love and Community in One Of Britain’s Worst Disasters, Gaynor tells her own story and interviews people affected by that day – from the bereaved and the rescuers, to the police and royalty. She explores the nature of courage, grief and faith, to create both a moving personal story of one family’s pain and a definitive account of the events that shook the nation and the world. ‘October 2016 marks the 50th anniversary of that awful day. For 50 years we have been trying to recover from the Aberfan disaster. It’s a long road, and we take it one day at a time.’ said Gaynor. ‘I’ve tried to tell this story in a way in which it has never been told before, beginning by reliving Aberfan through the eyes of a survivor. As a survivor, now 58 years old, I have been haunted by the memories of the Aberfan disaster. ‘I wanted to create the fullest picture of the disaster and its aftermath while people were still around to tell their story. 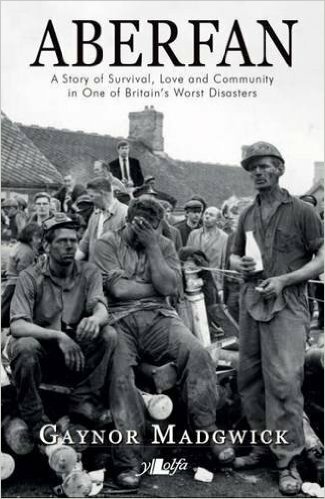 Aberfan – A Story of Survival, Love and Community in One of Britain’s Worst Disasters by Gaynor Madgwick (£9.99, Y Lolfa) is available now.